The 11 public hospitals in New York City will now observe Meatless Mondays. The hospitals, managed by the city’s Health + Hospitals division, will add new plant-based items to their menus each Monday. These items include: black bean soup, spaghetti and garden Bolognese sauce, three-bean chili, rice and beans, cream of potato soup, assorted fruits and hummus. New dishes will be added occasionally to keep the offerings fresh. Led by the Food and Nutrition Department of Health + Hospitals, the Meatless Monday program is designed to help patients maintain a healthy lifestyle, even when they’re not in the hospital setting. On the first Meatless Monday, on Jan. 7, 1,500 patients at the 11 hospitals chose one of the vegetarian selections. 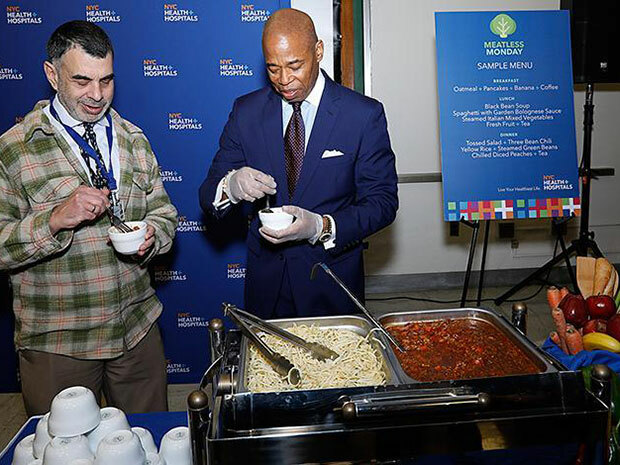 Meatless Mondays is one of many initiatives introduced recently as part of the Plant-Based Nutrition Program at NYC Health + Hospitals. The next initiative is Enhancement of Vegan and Vegetarian Menu, which focuses on introducing additional healthy offerings for patients throughout the week.